We've all seen the outrageous images: a monstrous oil spill is gushing as much as 2,500,000 gallons of crude a day into the Gulf of Mexico. Before the spill, U.S. President Obama and Congressional leaders were planning to ramp up offshore drilling. Now, with the spill, the politics have shifted -- and an opportunity has opened for the world's biggest historical climate polluter to shift away from oil and towards climate-safe energy sources. This disaster is expected to be catastrophic for the land and people in the gulf. 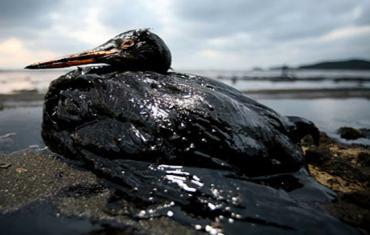 The oil has already reached land, contaminating wildlife sanctuaries. Authorities are so concerned about the impacts of more oil reaching land that they are prefer to set the gulf on fire, burning as much of the oil as possible. Meanwhile, the fossil fuel industry is raking in windfall profits. BP, which operated the sunken rig, more than doubled its first quarter profits in 2010 to $5.65 billion. It is extremely difficult to prevent oil spill into our ocean let alone the gulf of Mexico by multi-national oil corporation, these corporation had enormous financial clouts and money to buyout elected officials to let them destroy our environment and experimenting their advance technology by continue more deep earth drilling behind our backyard and ocean in the foreseeable future, as the demand of crude oil rise, more oil field and off shore rig are required to fulfill these demand, and more money can be make, but then our environment will face greater possibility of degradation and our air will be more polluted, it is a never ending cycle of 'evil man' make disaster that will continue to exist in our world today. Trying to stop another disastrous oil rig explosion and spill will go nowhere in this highly corrupted free world of government leaders. Sigh! We shall do our little parts and hope that the little parts will add up to great pressure and positive results. At least we act now. Justin, the dilemma we are facing now is because we can only do our little parts in stopping this man made disaster from spreading and happening, ordinary folks like us with no political power and don't have lot of $$ and weapons on hand can only make noises in blog sphere and can't change the outcome of the event in a real world that affect all ordinary people, unless the political elites willing to listen and put a lid on another horrific oil spill in our ocean and atmosphere by powerful corporation, all these add up little parts still not enough to reverse the future course of purposeful and well planned environmental destruction perpetrated by big oil. it is just the fact u need to face in reality. I think Avaaz is doing a good job. What is Avaaz, Justin?? Please explain .. Thank for the head up; Justin! Even with all these horrific deep ocean oil leaks and tragic death of 11 workers, it is still not enough for congress and Obama to call off all off-shore oil drilling, you need to understand that the oil industry does not pocket all the revenues from oil drilling activity, high percentage of it are shared among government agency through oil royalty and corporate tax; unfortunately, the recent accident is not enough to raise alarm inside these U.S high level government officials deep pockets. They still consider it is highly unlikely another accident like this will take place in the near future. So far, no deep water drilling had been pull off from any existing off shore rigs as you expected. Business go on as usual; hundred of millions of insurance money already gone into BP deep pocket as we speak.